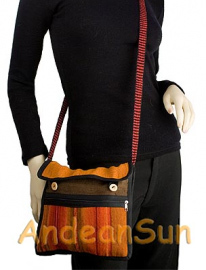 This purse has outer zip pocket and a 2-button closure; handwoven - each one different. Approximately 11" X 11". Colors include bright reds and oranges, with additional color highlights.